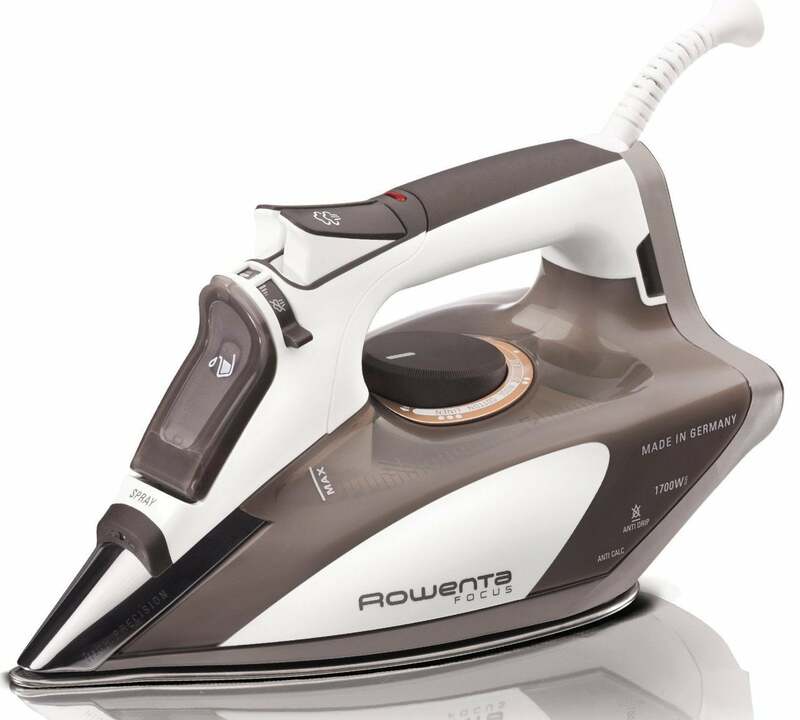 The Rowenta iron is fast and effective thanks to its especially high heat and steam output. It’s quick to warm up and it conserves heat for long periods of time. The best iron can unwrinkle a dress shirt in 3 minutes or less. Our Rowenta iron arrived damaged. The small clip on the water reservoir lid was broken, so it wouldn’t stay closed. A cost-effective and durable iron. Although, our Black and Decker leaked a little. This 4-pound iron is heavy enough to get the job done without requiring more muscle from the user. The steam production also is more than sufficient. The placement of the steam release button makes it easy for right-handers to accidentally press. This multi-directional iron simply glides over fabric. It also has the highest temperature reading of the irons we reviewed. 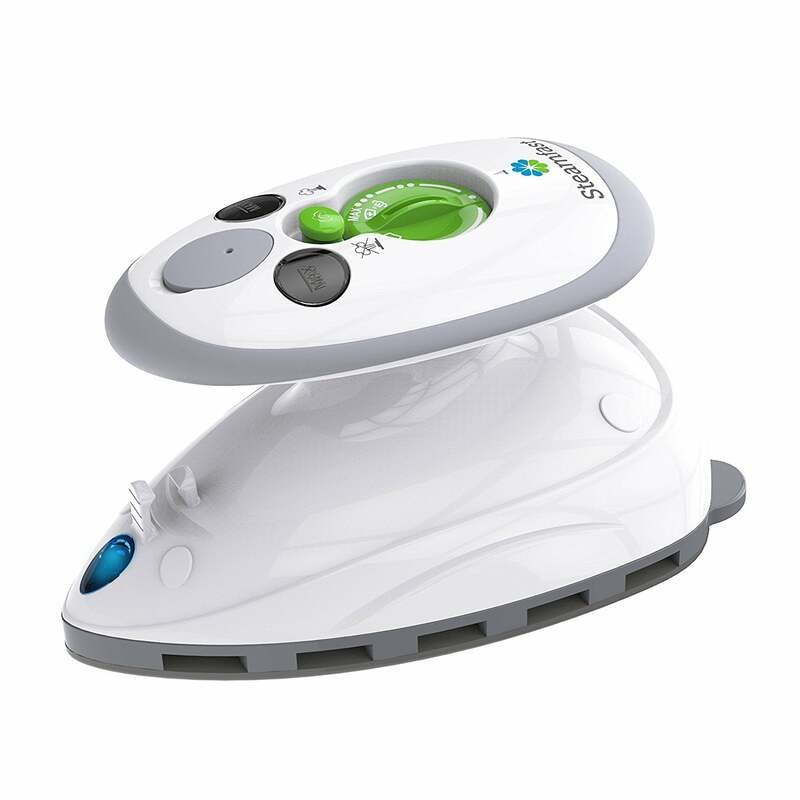 The 360 plate enhances maneuverability for an effortlessly smooth ironing experience. A few customers said the plate snagged their clothing. Others reported leakage. A solid iron that’ll do the trick—thanks to its weight and professional grade power—but may not last forever. 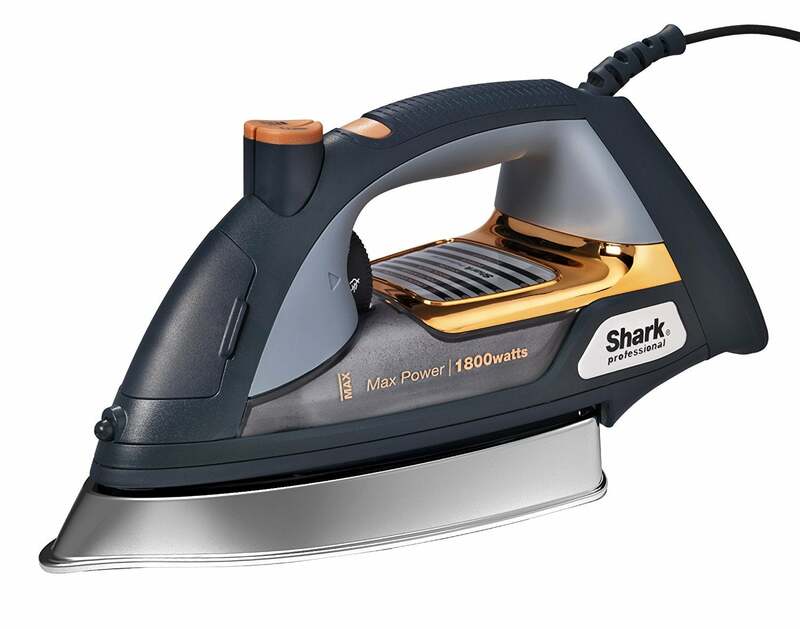 With 1800 watts behind it, the Shark iron is the most powerful steam iron on our list. It also has a large water capacity (10 oz), so you don’t have to stop and refill as often. It doesn’t sound like this is the longest lasting iron. Some customers report lower efficacy and even some failure over time. A lightweight option for travelers and crafters who need a small iron that still packs a punch. It’s mini and portable (less than a pound). The steam output is surprising given its small reservoir. It also has an extra long cord. Its small stature requires frequent refills and more time spent on ironing. To a lot of people, a steam iron is an ordinary, everyday appliance, so it may not seem like a very complicated purchase. And it really shouldn’t be. However, there are a few irons out there that could totally ruin your day—and wardrobe. A cheap iron may not have the temperature control, steam power, or soleplate quality you need to press all fabric types from delicates to denim. We skimmed over 12k steam iron reviews to find five of the best steam irons that checks all the boxes. Wrinkles are the worst, and that’s why steam irons were invented. With an iron, you can take your look from slightly disheveled to clean, crisp, and confident in three minutes or less. Of course, three extra minutes in the morning can be a privilege for those who are always in a mad rush to get out the door. In that case, we suggest ironing your outfit the night before. You can knock out this chore while you watch TV or have a glass of wine. However, if you happen to spill that wine or come across a dirty piece of clothing, note that ironing it will permanently press the stain into the fabric. We have more tips and considerations in the steam iron shopping guide below. Ironing can seem like just another chore, but we’ve learned that it’s a pretty painless process with high reward. You’ll look sharp and feel like a total boss. The soleplate is the bottom part of the iron that physically touches the fabric. To get the most out of your steam iron, look for those with high-quality soleplate materials. The soleplate affects how smooth (or bumpy) of a ride your iron provides as well as how effective it is. Pros—Durable, clean, and easy to maintain. Cons—Clean the soleplate often and be careful ironing graphic t-shirts, as these clothes irons are more susceptible to sticking to glue and decals. Pros—Lightweight, corrosion-resistant, and the fastest to transfer heat. Cons—More prone to overheating and scorching fabric. Pros—Good conduction and even distribution of heat. Static-resistant and non-stick. Cons—The ceramic coating has a tendency to peel. Pros—Durable with even heat distribution that likely won’t stain your clothing. Cons—The coating can wear and tear quickly over time. The Black and Decker iron was a close second to our top pick. It’s cheaper than our number one with comparable efficacy to the Rowenta iron. This product is has a stable weight for a firmer press. It gets your ironing done quickly, thanks to quick heating and high steam. Just keep an eye out for the buttons as you use it. Some customers have reported accidentally pressing the steam release button. When you’re shopping for an iron, you’ve got to get serious about steam. First, look at the number of steam holes an iron has. More holes mean steam is evenly distributed. Next, look at wattage and water capacity. You’ll want steady steam that you don’t have to stop and refill three times through ironing. Don’t overlook the burst-of-steam button either. Many but not all steam irons have this function. The pointed tip of a steam iron is designed with cuffs, collars, and buttons in mind. Some clothes irons have double pointed ends that are supposed to make them easier to maneuver, but many people prefer the flat heel to rest and store an iron upright. 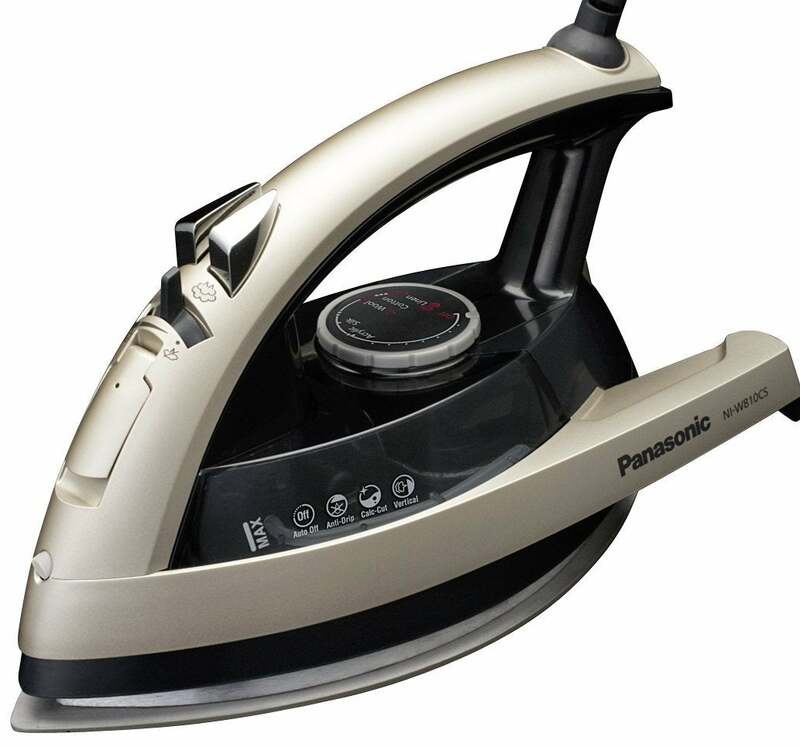 The Panasonic iron is a great example of a multi-directional steam iron. Weight is a delicate scale for irons. They should be light enough to use comfortably, but heavy enough to press clothing without requiring too much muscle from the person who’s using it. Many customers found the four-pound Black and Decker iron to be just right. If you travel often, especially for work trips with a formal dress code, you should look into purchasing a mini steam iron that you can tuck into your suitcase. 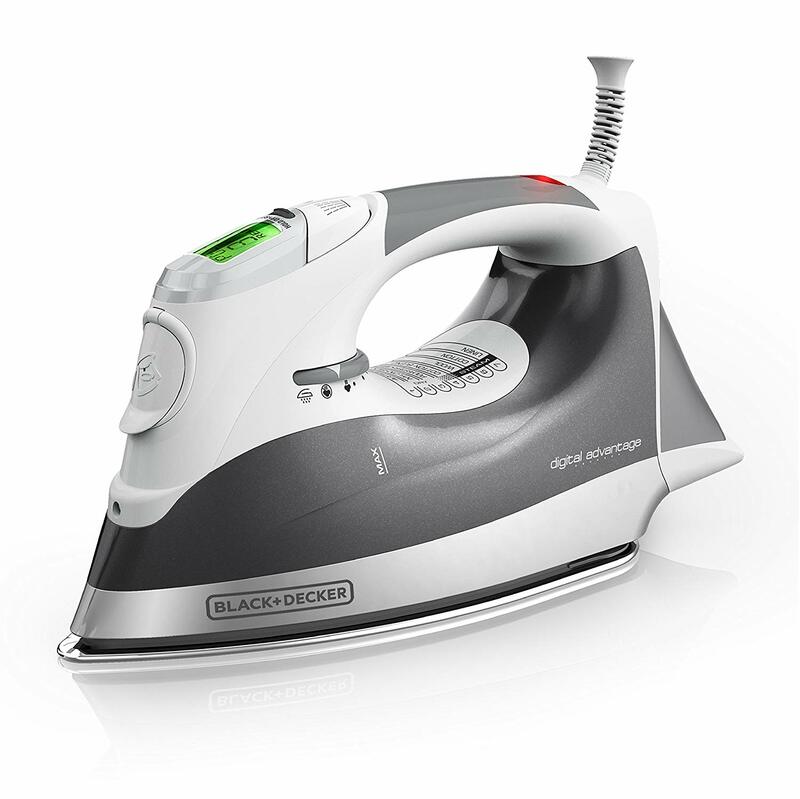 See the Steamfast Home-and-Away iron. Power cords can also affect the portability of a product. The advantage of a corded iron is that you don’t have to stop to reheat the iron. The advantage of a cordless iron is that you can move around more freely and travel lightly. An iron with a retractable cord seems like a logical solution, but you’ll have to be careful that the cord doesn’t jam inside the machine. Many modern clothes irons heat up in a matter of seconds. The Steamfast iron—the smallest iron on our list—boasts a 15-second heat-up process while a heavy-duty iron, like the Rowenta or Shark iron, takes about 30 seconds. You’ll want to look for an iron with multiple temperature setting. Most irons have at least three settings, but the more the merrier. You’ll want to be able to control the heat based on what type of fabric you’re working with and how heat resistant it is. Automatic shut-off is a safety feature that will automatically turn the iron off after it has been motionless for a certain amount of time or if it has been left on its side for too long. This can prevent a number of accidents, like fires and scorched fabric. Many irons have a burst-of-steam button that can be especially useful against stubborn wrinkles or on heavy fabric. The temperature and steam controls should be clear and easy to adjust based on the type of fabric you’re working with. Most steam irons take plain, old tap water. You can use a self-cleaning feature to remove mineral deposits that have built up from hard water. A vertical steaming option is nice to use on hanging garments, like dresses, or even living room curtains. Clothes steamers have sort of stolen the show recently. Garment steamers seem to be more convenient as they’re smaller than irons, they don’t require an ironing board, and they’re great if you’re in a hurry. However, if you have an important meeting or event and you want to walk out the door with freshly pressed clothes, you should reach for the iron instead. Unlike steamers, irons not only unwrinkle clothing, but they also press creases, crevices, and corners. Some manufacturers encourage users to try the steam burst button a couple of times before using the iron on clothing for the first time. Sort clothing from the least to the most heat resistant and start with the most delicate items. You can refer to the table below and your iron should also display temperature settings by fabric type. If you’re unsure about what kind of fabric you’re working with and how delicate it is, place it on a plush, white towel and lightly press the back of the garment on the lowest heat setting. Then, flip the fabric over and steam the front. Always let the iron cool before retouching delicate fabric and be aware that some fabrics must be damp while you iron. Drain and wipe your iron clean after each use. What is the best steam iron for clothes? The Rowenta iron is really fabulous. It’s fast and has all of the features we tested for: a large capacity water tank (10 ounces), a smooth stainless steel soleplate with 400 steam holes and a precision tip, high heat at a fast speed (1,700 watts to be exact), a self-cleaning system, anti-drip protection, a three-way automatic shutoff, and the ability to steam vertically. It’s got it all. For $30 less, the Black and Decker iron was almost as impressive as the Rowenta. You get a lot of steam from 1,500 watts and the digital display makes the temperature easy to read and adjust. Is a steamer the same as an iron? Which is better? There are a few defining differences between steamers and irons. First, steamers don’t physically touch the fabric while irons are designed to press clothing. Second, steamers work at a lower temperature than irons, so they’re great for delicate garments made of silk and satin, but irons are better for heavier fabric. Lastly, steamers only unwrinkle fabric. Irons press creases, collars, and cuffs for a truly crisp look and feel. In the hot steamer vs. iron debate, it’s hard to say which one is better. Steamers are quicker and easier to use, but ironed clothing typically looks dramatically better. How long does an iron last? Clothes irons can last one to five years depending on how often you use it. If you have a suit-and-tie job or if you’re a crafter, you’ll probably need to replace your iron much sooner than someone who only irons clothing for special events and other occasions. How do you unwrinkle clothes?